Sherlock: A Character Who's More Than Elementary What can explain the enduring popularity of Sherlock Holmes? 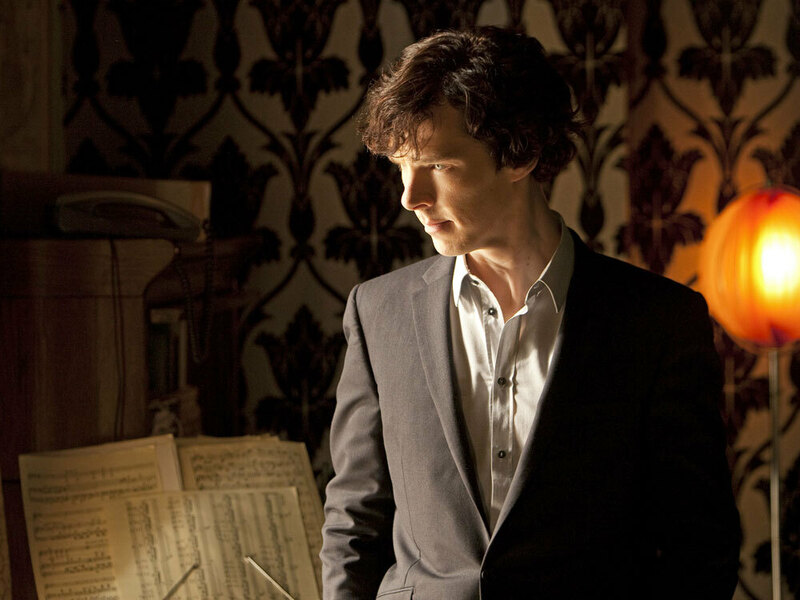 Critic John Powers says it's that Sherlock "embodies an archetypal aspect of the human psyche" — and appeals to the part of us that loves a good mystery. 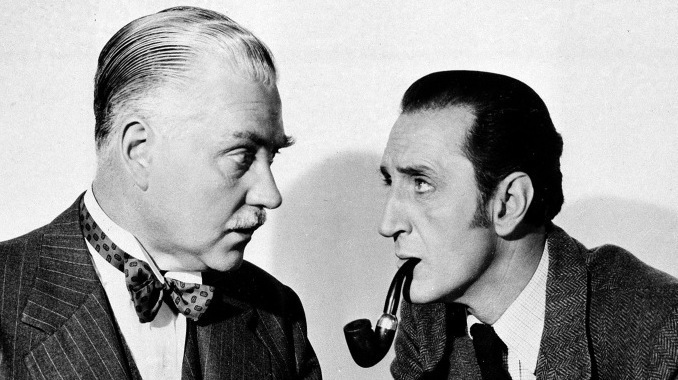 Basil Rathbone (right) as Sherlock Holmes and Nigel Bruce as Dr. Watson in The Adventures of Sherlock Holmes, 1945. One of my favorite professors, the late Ian Watt, taught that there were four great myths of modern individualism: Faust, Don Juan, Don Quixote and Robinson Crusoe. This always got me wondering which, if any, pop-culture heroes might endure in the same way. James Bond? Luke Skywalker? The Avengers? C'mon. In fact, there's only one who I feel sure will last — Sherlock Holmes. In the 125 years since Arthur Conan Doyle created the world's greatest detective, 75 different actors have played him in the movies, and scads more on TV, not to mention the countless knockoffs like The Mentalist or Mr. Spock, who once claimed Holmes as his ancestor. Benedict Cumberbatch plays a modernized Holmes who carries a cellphone and gets his buzz from nicotine patches. We've had him as a teen in Young Sherlock Holmes, as a wise-cracking action star played by Robert Downey Jr., and as a retired beekeeper in Michael Chabon's terrific little novel The Final Solution, where he encounters the crime of the century — The Holocaust. Now he's been updated as a present-day Londoner in Sherlock, the British TV series that offers the best version of Holmes and Dr. Watson I've ever seen. The obvious reason for Holmes' enduring appeal is that, while he possesses no superpowers — his parents weren't wizards, no radioactive spider bit him — his gifts are cool enough to be superhuman. Playing to our fantasies of being smarter than everyone else, Holmes performs jaw-dropping feats of perception. Like the one in the first episode of Sherlock: Martin Freeman's Dr. Watson has known Holmes all of 90 seconds when Sherlock, played by Benedict Cumberbatch, talks about renting a flat together — and gives Watson a taste of just who, or maybe what, he's dealing with: an astute observer who picks up intimate details about Watson's personal life seemingly out of thin air. This Holmes is a bit of a showman, one who feels sure that he ought to be mythic. He's right. Like all mythic figures, Sherlock embodies an archetypal aspect of the human psyche — in his case, the power of rational thought. "I am a brain," he tells Watson in one story, "the rest of me is mere appendix." And as a brain he is the embodiment of the scientific mind. A relentless empiricist, he not only notices details that ordinary folks don't, but he also treats all of reality — from tobacco ashes to a dog that doesn't bark — as a collection of clues. He puts these clues together to solve baffling crimes, which can involve a pygmy murderer, a poisonous snake or a gigantic hound. Now, lasting mythic heroes tend to emerge during periods of psychosocial tumult when old values are being threatened by new ones. Holmes came to life in 1887, during the waning years of a Victorian era in which everything from the traditional social order to the belief in God was being subverted. It's no accident that this same period produced three other literary creations who spoke to a sense of chaotic darkness bubbling beneath the surface of things: the blood-drinking Dracula, the murderously schizoid Dr. Jekyll and Mr. Hyde, and, of course, Peter Pan, who refused to grow up into the complicated world of adulthood. Their mythic power still persists, but mainly as metaphors like the Peter Pan Complex, or in the welter of hip vampires roaming our pop culture. Sherlock remains Sherlock. Of course, darkness bubbles in Holmes' world, too. If he lacks the tragic dimension of Faust — a fellow thinking machine, but one with ambitions so grand they damn him — he's not a cipher like 007 or Hercule Poirot. His monomaniacal genius borders on sociopathology. It cuts him off from humanity. He has but one friend, Watson — his Sancho Panza and our surrogate — and but one great love, Irene Adler, whose appearance opens Season 2 of Sherlock with a bang. When he's not solving crimes, boredom and melancholy lead Holmes to the violin — or cocaine. Yet if Holmes' desire for oblivion hints at the lonely man lurking beneath the brilliant superman, it remains less potent than his sheer joy in asserting rational control over purveyors of chaos like his archenemy, Professor Moriarty. Detective stories are about learning the truth and restoring order. That's their power. And for Holmes, that's also their fun. Indeed, one reason why Sherlock still feels so fresh is his pleasure in the chase. Never dull nor moralistic, he embodies that part of us that's turned on by a mystery, who when he hears of a murder, feels that special tingle and cries, "Come, Watson, come. The game is afoot!"